The Way you present yourself to the world! "Minimum Dentistry for Maximum Longevity"
These are some of the reasons that people seek Cosmetic Dentistry. How you feel about yourself is important. If you desire a change, modern dentistry has many new materials and techniques that can create a beautiful smile. Cosmetic Dentistry involves elective procedures, and may involve making changes to teeth that have not suffered any of the damage of dental disease. High Quality Cosmetic Dentistry requires meticulous attention to detail. It's the little things that count. Just because teeth are white does not mean that they are cosmetic; a natural beautiful smile is the goal. Color is only one factor in creating a beautiful smile and many other factors must be considered in order to create a natural, beautiful smile. Cosmetic Dentistry can help you be happy with who you are. Dentistry can now enhance your smile. Advances in Porcelain and other dental materials allow us to restore your mouth with Tooth Colored Restorations. Veeneers, Tooth Colored Fillings, Bleaching, Bonding, Porcelain Crowns, Orthodontics are some of the topics covered in this website. You now have a choice! 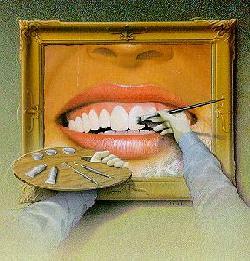 The key as with any fine high Quality Dentistry is attention to detail.